Alternative facts, indeed. Less than two weeks into the presidency of Donald Trump it appears we are seeing the ushering in of a new era of twisted truths, fake news, and selective science. That should be good news to the corporate spin doctors who are deep into a campaign now to try to combat global concerns about the world's favorite weed killer. Corporate spin is nothing new. Whether it's cigarettes or sugar-laden sodas, the companies that make billions from such products employ a variety of strategies to promote the good and bury the bad. Some even outright lie while doing so. But the tactics being unveiled by Monsanto and surrogates over glyphosate, the key ingredient in Monsanto's Roundup herbicide and the lynchpin for the success of genetically engineered crops, are noteworthy for the depths of their deception. The latest move, the formation of a group called "Campaign for Accuracy in Public Health Research", (CAPHR) clearly promotes an agenda opposite to that which its name implies. Formed this month by the American Chemistry Council, whose membership includes Monsanto and other chemical industry titans, the group's express purpose is to discredit the International Agency for Research on Cancer (IARC), a unit of the World Health Organization made up of independent scientists. An IARC scientific team declared in March 2015 that glyphosate was a probable human carcinogen after reviewing an extensive body of published research on the subject. Monsanto and friends have been harassing IARC ever since through a series of demands, threats and legal maneuvers, including lobbying the U.S. House of Representatives to cut funding for IARC. The new campaign takes the assault further. On the group's new twitter account, set up on Jan. 25, CAPHR has posted a string of insults against IARC scientists, accusing the experts from prestigious institutions around the world of "making sensational claims," drawing conclusions "that can't be trusted," and using "questionable methodologies." If CAPHR is to be believed, the public, lawmakers and regulators should not trust the epidemiology experts, toxicologists and other scientists who made up the IARC working group, which was led by an award-winning cancer expert from the National Cancer Institute. No, they should look for unbiased information about the safety of the industry's billion-dollar baby from the industry itself. The chemical industry campaigners insist that the people making money off chemical sales are more trustworthy than scientists who have made a career studying causes of cancer. The rationale for the campaign is clear: It's not about protecting public health, it's about protecting corporate profits. Monsanto said as much last week in a California court as it tried to block the state's decision to require a warning on Roundup. Monsanto attorney Trenton Norris argued in court Friday that warning labels would hurt the company's finances because many people would stop buying Roundup. Fresno County Superior Court Judge Kristi Kapetan did not seem moved by the profits-over-people message. She still must issue a formal decision, but said that California can require Monsanto to label Roundup as a possible cancer threat. Protecting glyphosate is critical for Monsanto and other chemical industry giants now. Not only are glyphosate herbicides big sellers around the world, but the industry is in the midst of rolling out new genetically engineered crops designed to be sprayed with combinations of glyphosate and companion weed killers. Monsanto has developed crops altered so that they tolerate being sprayed with glyphosate and dicamba, while Dow AgroSciences has developed crops tolerant of a new herbicide made of glyphosate and 2,4-D. The new biotech crops build on Monsanto's glyphosate-tolerant portfolio of corn, soybeans, cotton, canola and other crops. 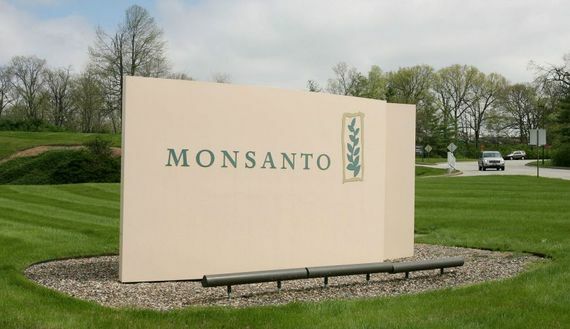 Court records show that plaintiffs' attorneys are building their cases around the IARC classification, while Monsanto is counting on the backing of the Environmental Protection Agency, which has stated that glyphosate is "not likely" to be carcinogenic for people. Just as Monsanto is trying to tear down IARC, plaintiffs are trying to discredit the EPA findings, saying Monsanto has unduly influenced the agency. On the same day that the chemical industry launched its anti-IARC campaign, U.S. District Judge Vince Chhabria ordered each side in the Roundup litigation to submit briefs on how the work by both IARC and EPA is or is not relevant to the cases. The briefings are due Feb. 8. 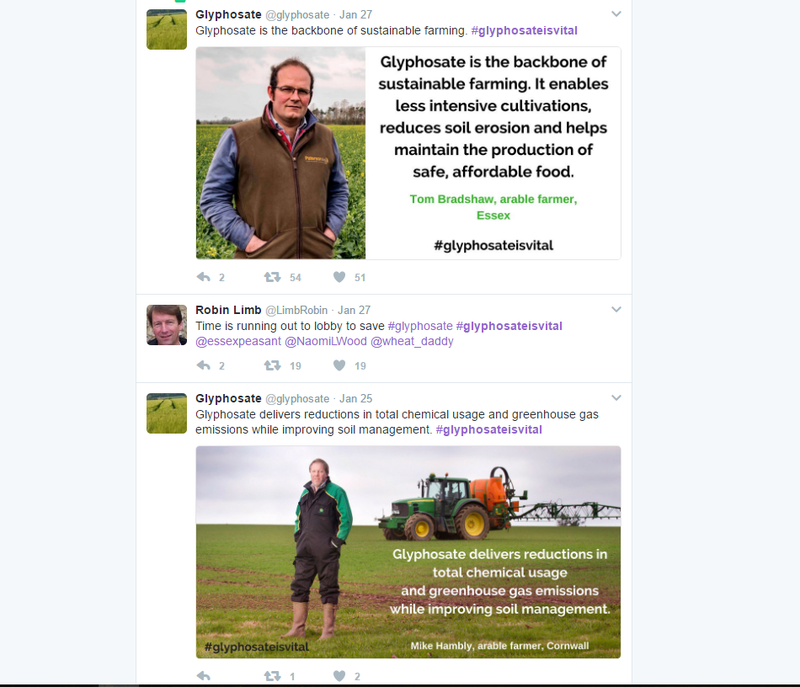 Clearly not content to allow a federal court to sort out who is right or wrong on glyphosate, the chemical industry's championing of glyphosate includes a new promotional Twitter campaign #glyphosateisvital with postings proclaiming that the weed killer is essential to "maintain the production of safe, affordable food." "Time is running out to lobby to save #glyphosate," another posting asserts. 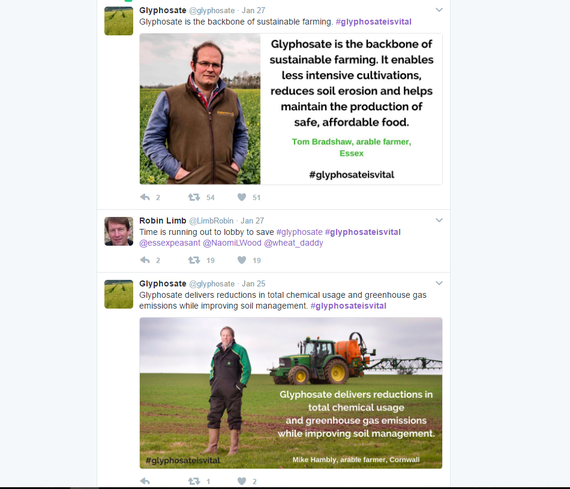 The campaign is featured on the @glyphosate twitter account established immediately after the IARC glyphosate classification. Embedded in the industry's truth-twisting tactics is the characterization of anyone who gives credence to scientific research showing problems with glyphosate, or the GMOs that go with it, as "anti-science." It's an effort to reverse reality and detract from the fact that it is industry backers, not industry critics, who deplore the findings of independent, peer-reviewed scientific research. "The pesticide industry recognizes it's on the defensive," said environmental lawyer Charlie Tebbutt. "It's doing everything it can to transform reality."